She holds up a snapshot of an infant. "This is Luke, my baby brother, and I'm going to tell you about his birth day." "Then the Middle wife starts talking to Mom and helping her breath. Then, all of a sudden, out comes my brother. He was covered in yucky stuff that they said was from Mom's play-center, so there must be a lot of toys inside there." Erica stood up, took a big theatrical bow and returned to her seat. I'm sure I applauded the loudest. Ever since then, when it's show-and-tell day, I bring my camcorder, just in case another "Middle Wife" comes along. CHENNAI, India (Reuters Health) - Initiation of breast-feeding within the first hour after birth or during the first day of life reduces the risk of death for the newborn, according to results of a study from Nepal. Dr. Luke Mullany and colleagues from the Johns Hopkins Bloomberg School of Public Health in Baltimore and a team with the Nepal Nutrition Intervention Project, Katmandu, analyzed data on measures to reduce newborn deaths. As a part of the study, reported in the Journal of Nutrition, 22,838 newborns were seen by health visitors at their homes soon after birth, then on multiple occasions till the 28th day of life. Information on feeding practices and illness was collected, height and weight measurements were carried out, and causes of death after 48 hours up to 28 days were determined using a structured questionnaire. Breast-feeding was initiated in 3.4 percent of babies within the first hour of birth, in 56.6 percent by 24 hours and in 97.2 percent by 72 hours, Mullany's team reports. Others received formula and animal milk, they add. Two hundred and ninety seven infant deaths were recorded between day 2 and day 28 of life in their group, they note. The investigators also noted a trend toward higher mortality that correlated with increasing delays in the state of breast-feeding. For instance, babies who were not breast-fed until after the third day were four times more likely to die than those fed within one hour. The death risk was also 77 percent higher among partially breast-fed infants compared with those who were exclusively breast-fed, they note. "Approximately 7.7 percent and 19.1 percent of all neonatal deaths may be avoided with universal initiation of breast-feeding within the first day or hour of life, respectively," Mullany and colleagues estimate. "Infants breast-fed in the first hours of life receive milk with the highest level of protective factors including (antibodies) and protein," Mullany told Reuters Health. Early breast-feeding may also help establish successful breast-feeding patterns throughout infancy. Improving breast-feeding practices in low-resource regions with high infant mortality rates "may substantially improve survival," he believes. "Our challenge is to improve culturally appropriate messages that promote this behavior change, and provide the necessary home and community support to enable mothers to provide early breast-feeding," Mullany concluded. SOURCE: Journal of Nutrition, March 2008.
i'm a huge advocate for adopting unwanted dogs -- NOT purchasing from breeders. The American College of Obstetricians and Gynecologists recently issued a statement where they said that more women are choosing birth at home with midwives because it is "trendy" and "fashionable". I do believe they are missing the point. That is NOT the reason educated women are choosing to birth at home. Dr. Katie Prown (Campaign manager for The Big Push for Midwives 2008) responded by saying, "It will certainly come as news to the Amish and other groups in this country who have long chosen homebirth that they're simply being 'trendy' or 'fashionable.'" 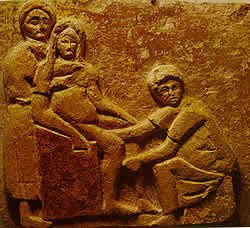 "Who said that homebirth was trendy? I would love to refute that! While I'm glad I had my homebirth, and now that I know how amazing it is, I would do it again even if I didn't feel I "had" to, the main and only reason that brought me to seek out homebirth was my lack of other options. Sorry, but I didn't want to have a csection. If anything I was being anti-trendy, because I didn't want a csection, and I wanted a natural birth. That is too funny that someone would say it is trendy to birth at home. (especially when my family members acted like I had three heads when I told them my plans!) I guess they are saying it because it is becoming more popular or because celebrities are doing it. But I think they have missed WHY people are doing homebirth. Thank God there are people out there smart enough to choose homebirth for their first child, and not just as a last resort. But sadly, as care gets worse and worse, it is for this reason more people are turning to it. Happily, once turning to that choice, I think just about anyone would wonder why they hadn't started out there in the first place. I just wish I had known about homebirthing with my first baby." Those are my sentiments as well. I can go into a hospital with a 95% chance of unnecessary interventions, a 45% chance of ultimately being cut open, and a 100% chance of not being allowed to move and eat and drink and labor and push as is best/most comfortable for me and baby. Or I can birth at home. Statement to the Press: Third International Symposium on Circumcision, University of Maryland (5.25.94). These hands have taken a newborn baby from his mother’s safe warm breast and his father’s sheltering arms, and these hands have tied this baby to a cold hard platter and served him up to the circumciser. These hands have readied the scalpel, even as they caressed the brow of the terrified baby as he struggles for freedom and searches my eyes for compassion he will not find. A tortured being has sucked frantically on this finger in a hopeless effort to end the agony as his flesh – his birthright – is ripped from him and thrown in the garbage. I am a conscientious objector in the war against our infant brothers and sons and it feels wonderful. Mary Conant is a co-founder of Nurses for the Rights of the Child. She is one of the original 24 Conscientious Objectors to Circumcision nurses at St. Vincent Hospital, Santa Fe, New Mexico. She also appears on Barry Ellsworth’s video documentary The Nurses of St. Vincent: Saying No to Circumcision.